Factory5 have taken their precision cut dual-plane, super-light Lattice chainring and paired it to their Pista Track crank arms; forged aluminium 6061 that has been heat treated to T6 temper. Not only do they look fantastic together, they combine to make a performance crankset. 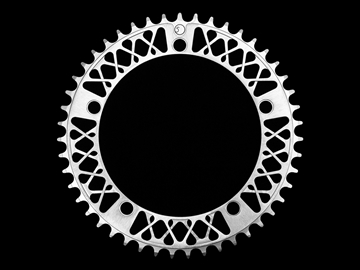 The upgraded 2017 edition of the chainring have an increased lattice thickness, increased plane thickness, and an increased lattice pitch to make it stiffer than ever before. Crank arms are 170mm, 144BCD with a JIS taper. On a standard 68mm bottom bracket shell, a 103mm BB will give a 42mm chainline, 107mm for 44mm. The Pista hubs are CNC finished and fitted with sealed bearings. The two cross spoke lacing pattern provides lateral rigidity while the large cutout flanges improve stress distribution and help reduce the overall weight to just 1720g. Paired with Giant SL24 rims and laced with DT Swiss 2.0 stainless steel spokes. The F5 Titan Stem is an evolution in traditional quill stem design. F5 always wanted a stem that could accommodate 31.8mm handlebars without having to use an adapter and still look classic enough that it would compliment any 1″ threaded headset bike. Made from 7075 aluminium, it is incredibly light. The removable faceplate is held in place with two stainless steel screws and subtly finished with the Circle F5 logo laser-etched in the centre. The stem is high polished and deep anodised in silver and black to give the traditional quill stem look. It delivers performance and style, which for a component with so much attention, delivers exactly the right level of satisfaction.